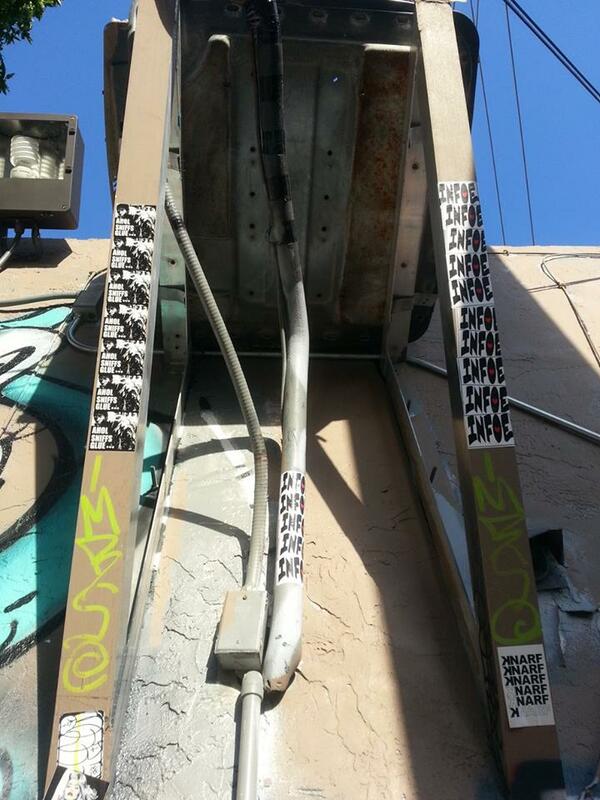 Urban Artists and STICKER Aficionados Infoe (@infoe_stv) and AHOL (@AHOLSNIFFSGLUE) amongst many others in the Urban Art scene in Miami have made continuous efforts to keep the memory of Israel Hernandez aka Street Artist REEFA, alive, after he was tased to death for tagging an abandoned McDonald’s. Not only is this a bit dramatic on behalf of the Miami Beach Police Department, but it is incredibly TRAGIC, BRUTAL, and OBSCENE – RIDICULOUS too, may I add. In a conversation with AHOL regarding the event he honestly states, “There is still a lot that needs to be done for their case legally and bringing awareness. 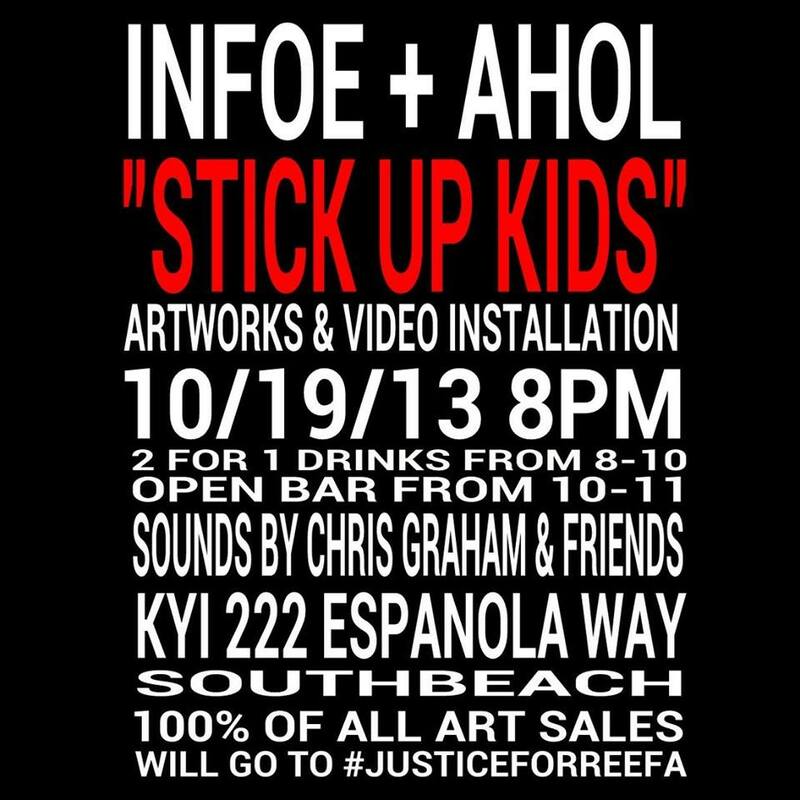 We are lending our names to the cause to help in any way we can.” And thus an ART SALE will be taking place this SATURDAY MIAMI. ALL PROCEEDS, YES ALL PROCEEDS, WILL GO TO #JusticeForREEFA. Here is the info below. Please share. JUSTICE NEEDS TO BE SERVED. RIP REEFA. You are always in our thoughts. 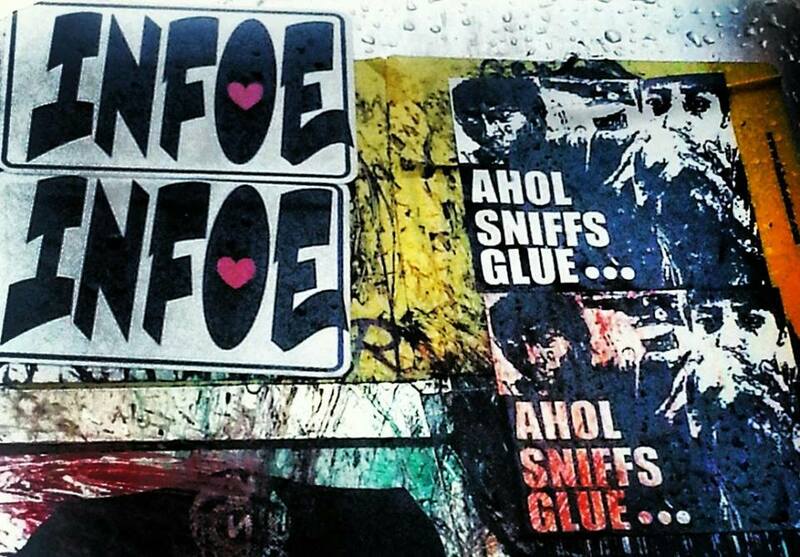 Miami Street Art Sensation AHOL (@aholsniffsglue), who represents the #SSK crew, has got EYES all over the 305, literally. 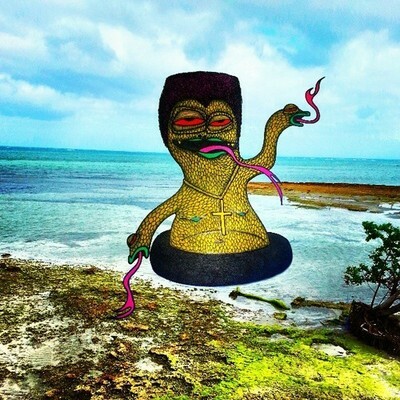 However, his most recent projects – #BiscayneWorld and his digitally chopped up images (which he creates on his cell phone with original pictures) deviate from what we are used to seeing on the streets. Before you read the interview we were so LUCKY to have with him, here is a video from his Sniper Show (below) which conveys a different kind of energy and intensity than that which we see painted on the walls of the 3-0-5. What we also don’t discuss in the interview is how this artist makes his work accessible to his fans – he leaves signed #BiscayneWorld prints all around Wade County – you just have to go on an adventure to find them with clues that he sends out via instagram!! I don’t know any other artist who does such a thing. He wants his fans to be engaged, and that is something that has CAPTIVATED our attention. 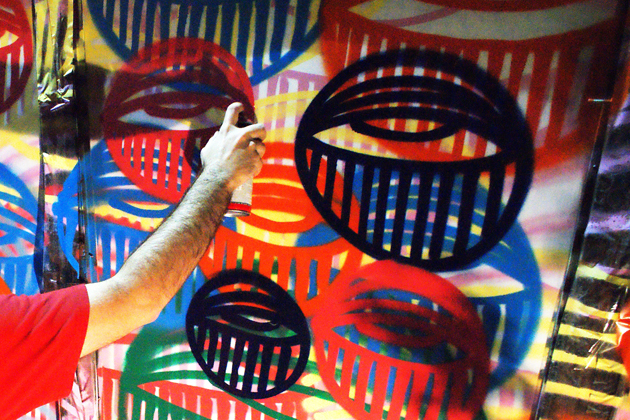 Read ze INTERVIEW to find out why we He(ART) and admire this artist. DP: While people in MIAMI may recognise your work, being a South Florida native, what other cities do you enjoy working in? 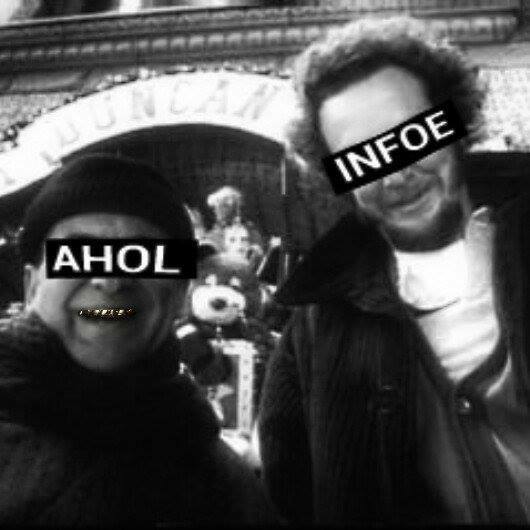 AHOL: I’ve lived in MIAMI all my life. I identify with my city. 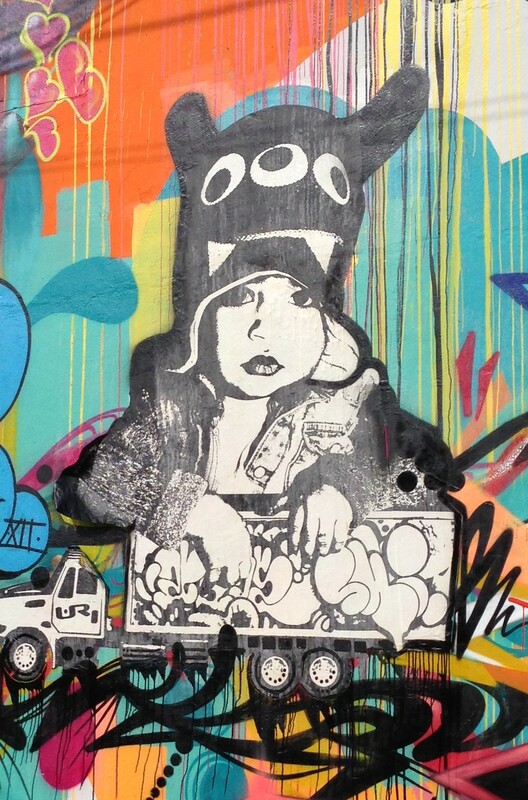 I’ve gone to other states up the east coast and countries and spread some of my work but Miami is what matters to me. DP: Your eyes are what I am most familiar with as is your style from spray paint, but what other symbols are commonly found in your works and what other mediums do you enjoy working with? AHOL: I try and tie a lot of my stuff together. The eyes come from my characters, the characters tell a story of the common person. My pictures are Miami oriented and my digital cellphone photo chopped images are all Miami based (see image below). I use any medium accessible to me. Possibilities are endless and SPONTANEOUS creation is my favorite. DP: My mom (who is now my biggest supporter and getting into the whole idea of street art) sent me an article regarding your accident. How horrifically tragic. I am truly sorry but I am SO happy that you have gotten back up and started working again. It is very inspiring. Do you think your style has changed since the accident. Do you look at your art differently? AHOL: The accident sucked. I am truly blessed to be alive. Many things have come from it. I am now working with Gregg Shienbaum who supported my work through the accident and now I am proud to be a part if his gallery. After the accident, my HUSTLE and DRIVE has been TURNED UP HIGHER THAN EVER. DP: I checked out your website and I see your paper works encompass a lot of geometric shapes and linear lines. Would you agree that this differs from your work on the streets? AHOL: Those paper works were part of an urban landscape series I worked on that meant a lot to me. They are very similar to my eyeball line work and attention to detail but in a more free calculated and uncalculated way. It’s hard to explain. 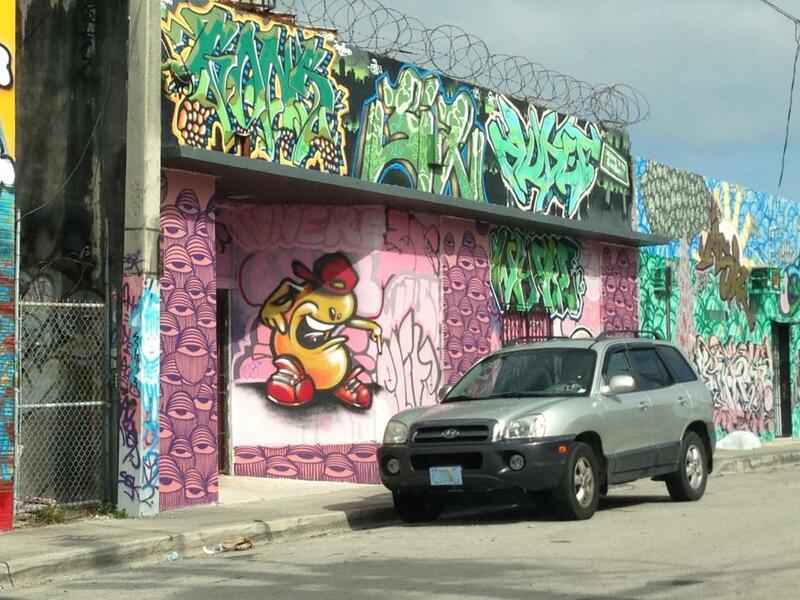 DP: Your latest mural is going up as we speak in Wynwood? What gallery is this for? And are you putting on a show in that gallery? If so, what are the dates for everyone to go and check it out?! 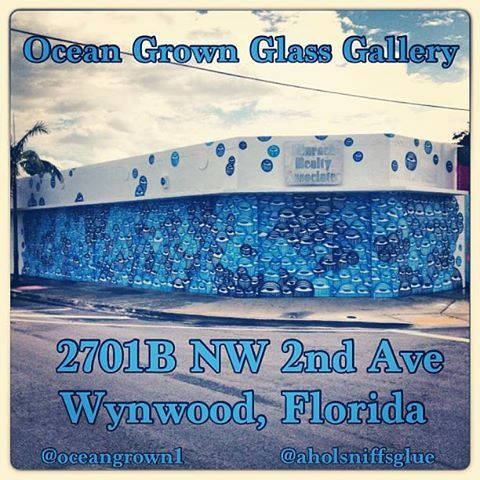 AHOL: The blue mural (above) I’m working on is at Ocean Grown Glass Gallery on NW 2 and 27 Street in Wynwood. They are going to be raising the bar in glass art in the area. They are awesome people and I am thankful they commissioned me to bless their walls. I may be collaborating on something with them in the near future but its still in the talking stage. DP: Where can we purchase your works? Your online store only sells clothing – but what if we want some prints? AHOL: I sell some shirts on my site AHOLSNIFFSGLUE.COM. All my fine art can be purchased directly from Gregg Shienbaum from his gallery in Wynwood Gregg Shienbaum Fine Art. There ya have it folks. 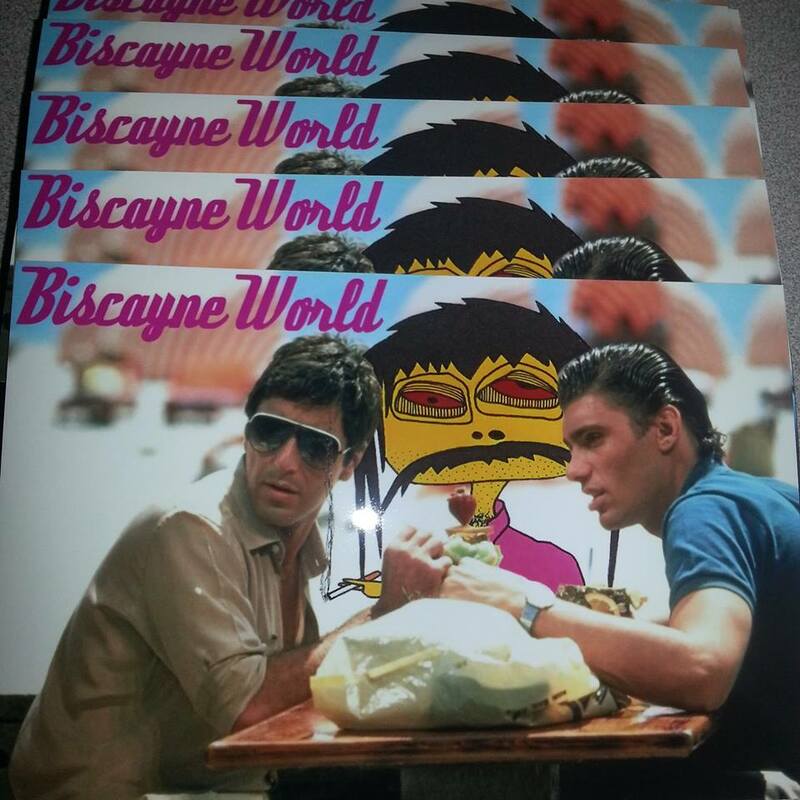 Keep following our dear friend on Instagram @aholsniffsglue, for more secret scoops regarding #BiscayneWorld are dropping soon… REMEMBER, HE’S GOT EYES ON MI-YA-YO. Keep them open. Remember, beauty is in the EYE of the beholder.